Nathan and Jessie Paine created an estate that reflects pride in their English heritage and Wisconsin home. In 1925, they commissioned Bryant Fleming, an architect from Ithaca, New York, to design a Tudor Revival-style country estate. Both Nathan and Jessie’s ancestors were English, which likely inspired their selection of this architectural style and much of the interior design and furnishings. Architect Bryant Fleming varied the house’s interior and exterior architectural features, such as arches, doorways, columns, window panes, and chimney stacks, to give it the appearance of being built over three centuries in evolving English styles. 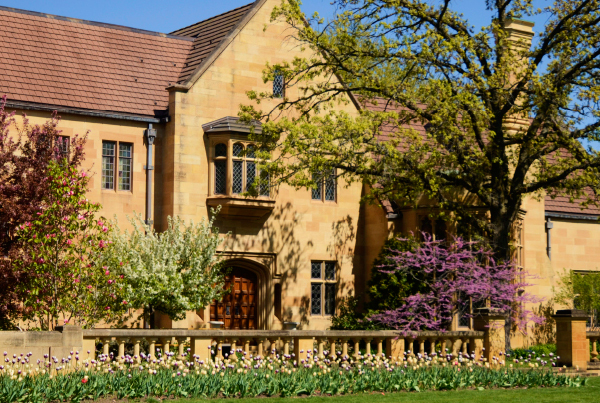 Much of the estate’s architecture, décor, artworks, and landscaping derives from English country houses while utilizing and accentuating the natural resources and beauty of Wisconsin. Mr. Paine played an instrumental role in most details of the estate’s design, décor, and landscaping. He had a keen sense for quality in materials and craftsmanship and acquired the finest domestic stone and wood for the main house. Nearly all of the stonework is Kasota limestone, quarried in Minnesota. In areas inside the house where the limestone is polished, it has a sheen resembling marble. The interior woodwork, mostly of oak and walnut, benefited from Mr. Paine’s profound appreciation for lumber and craftsmanship. Although the mansion was designed to look centuries old, it is in fact a thoroughly modern structure. Beneath the limestone and wooden beams, a steel and concrete substructure renders the building fireproof, which Mr. Paine felt was vitally important. The furnishings on the first floor were carefully chosen by Nathan and Jessie with the direction of decorator Phelps Jewett. Because Mr. Paine believed in the quality of the craftsmanship of his time, many of the furnishings are reproductions he commissioned specifically for this house. Their styles mimic various historical periods; some pieces are even upholstered in antique textiles to further the illusion of age. The second floor rooms were not completed during Mr. Paine’s lifetime and only partially finished during Mrs. Paine’s. When the museum first opened, these rooms were not on view. They have been completed or modified over the years to display Paine family heirlooms. Although the Paines never lived in the mansion, it was designed to serve as Nathan and Jessie’s home. As a result, the interiors reflect the predominant traditions of their time. 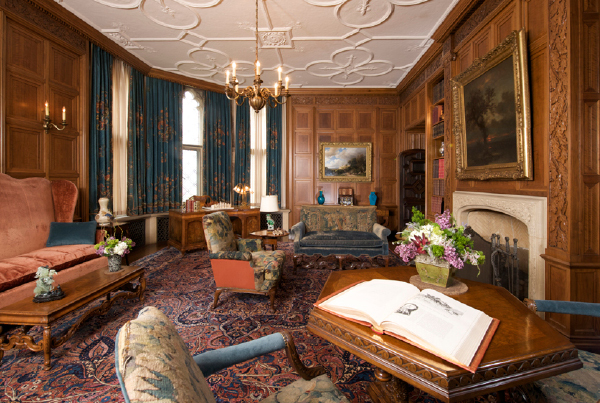 First floor rooms were designed to impress and entertain visitors. 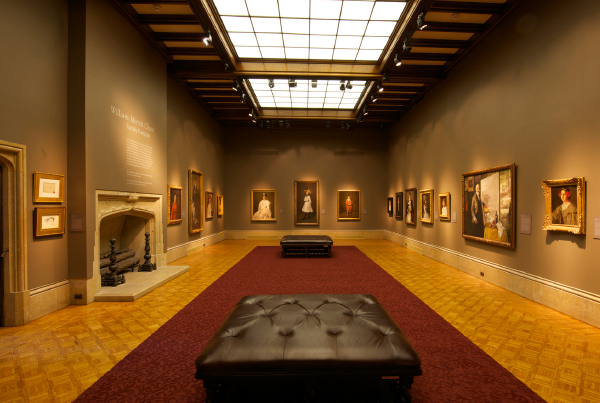 In the Paines’ case, this also included an area open to the public as an art gallery. Upper floors were reserved for private family activities and sleeping rooms. They were typically closed to all but the closest friends and family. Families of the Paines’ stature also would have employed live-in servants and accommodated them in the simply designed, utilitarian parts of the house. Public, private, and service areas are all found in the Paine mansion.